Perhaps it was inevitable. Sometimes it seems the universe has this weird way of turning things around, making us eat our words, challenging us to reconsider our preconceptions and prejudices. Not that I ever had a prejudice per se against worshippers of Brigid, the Celtic triple-goddess of fire and motherhood — it's just that they always seemed so... silly. And maybe a bit unimaginative. Brigid is, after all, a wildly popular deity even among non-Celtic Pagans, and one of the best-known saints among Catholics. Refusing to go down without a fight, She is a fiery feminist's dream, as well as a patron of healing, poetry and smithcraft. Enter every teenage LARPer bidding on eBay for replica swords, every amateur herbalist smashing plants into mush in little bowls, every self-styled poet who ever put two words together down on paper because everybody just doesn't understand. And all that enthusiasm and fervor, all that gushing in embarrassing verse, it always felt to me like so much celebrity gossip. So maybe it was inevitable that at some point, despite all my protestations and dismissive scoffing, Brigid would come for me. No, scratch that. It was a nondescript day at the beginning of February 2009 and I was in the back of the local Coffee Tree huddled over steaming chai and Judy Harrow's Spiritual Mentoring: A Pagan Guide. I had been writing recently about spiritual aesthetics, and now I was deep into Harrow's discussion of the three approaches to deity which she described as blue, red and yellow. Those colors will perhaps forever stay with me as the colors of polytheistic theological possibility. And I was, as usual, true Blue all the way through. 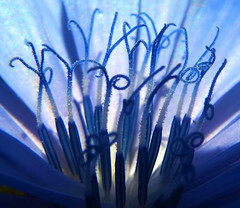 In Harrow's theory, the "Blue" conception of deity was as Deity, the Source, the Utter Mystery of ineffable divinity and spirit, out of which we puny humans grasp and gurgle and mold little images of god and goddess that we can relate to and appreciate without our brains going all wibbly-wobbly. The "Red" conception of the gods was that they were actual, individual, objective beings, albeit living on some higher level or plane far beyond that of humanity and the mundane physical world we ordinarily experience. "Yellow," on the other hand, saw the gods as psychological constructs, archetypes in the psyche representing abstractions like Justice and Love, meaningful and in some sense true, but not objectively real as were the deities of Red. 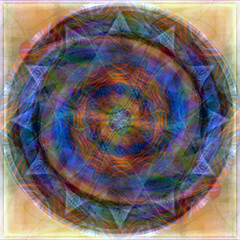 Harrow suggested that students draw and color a triangle on a sheet of paper, each corner of color fading and blending into one another as they converged towards the center, and then map their own conception of deity onto this image, capturing the blend and mix of their own beliefs, perhaps charting the change over the course of several months. She also suggested that a person could learn how to move freely among these various theological notions, depending on circumstance and need, and that being able to enter a Red conceptual space was practically paramount for effective ritual in which the gods were experienced as real, personal entities who could be in meaningful relationships with practitioners. And here was where I ran into trouble. If I had just been content to remain comfortably entrenched in my Blue corner of Spirt-and-Void, then perhaps it wouldn't have mattered so much where Red and Yellow might be found or how you were supposed to get there. But as soon as that whisper in my mind began, the urge to move, Harrow's splendid Triangle of the Gods transformed from a helpful little visual aid to a frustrating graphical quagmire. The problem was that it was a two-dimensional graph, with three axes (and I don't mean the kind with cold metal edges and lumberjacks attached at one end). The problem may not be immediately apparent, but I was stubborn; I had been doing what I felt was meaningful and effective ritual for years, without ever having to abandon my deep Blue All-That-Is-Art-Thou-I-Am-Etc. and I had no intention of abandoning it now. Yet it seemed that, in order to move towards Red, I had to loosen my grip on Blue — and worse yet, moving along the Blue-Red axis within this two-dimensional triangle meant that I also inadvertently changed my relationship to Yellow as well! The height of any given color lay directly above the center along the axis of the other two, so that moving towards Red from Blue, I moved closer to the heart of Yellow while having to relinquish my spiritual home in Ineffable Mystery! This just wouldn't do. Not least because I had no idea if it was actually true or not. Did a person discover, as they moved from color to color, conception to conception, that their overall relationship to all three "points" changed, and in precisely this way? I couldn't answer such a question experientially, and so for several hours I obsessed over the possibilities, tackling the metaphor from one direction and then another, filling pages in my notebook with roughly sketched graphs and scribbled notes. This might not have been so interesting to someone who wasn't, you know, crazy. But it kept nagging at me. What was it that the Blue-Red axis described, anyway? Along it, the gods tended towards being either unique individuals or facets of the Whole; while along the Red-Yellow axis, they were either external and concrete, or interior and abstract. What would happen, then, if I moved towards Red without giving an inch towards Yellow, if I moved towards individuality without caving in to abstraction? Graphically, I shot straight up and out of the triangle all together. And I knew the answer to this one in terms of experience, too: I ended up in poetry, and music, and art. There, clustered around that point of Red where the gods were Beings who danced and gambled and fell in love, were the concrete particulars of the physical world, the realm of beauty that could never be abstract, that was always unique and specific, palpable and sensuous. I knew this place well, had attended to it with devotion for many years, and I knew the path and the process that led back, back to Spirit through the microcosm of the real, back to Mystery through the fading darkness of inadequate language, treading ever nearer to unsatisfying abstraction and away from the hard smell of the material world, deep into the redeeming Blue. It was: imagination. And that was my little revelation, there in the Coffee Tree, a year ago today. It was imagination. Imagination was the process and the path whereby we brought the concrete world within, moved from the external world of particulars and particles bombarding our porous and vulnerable senses, to the interior world of the contemplative spiritual life where we might touch, just for a moment, the fragile and trembling Greatness of unsayable All-Being-and-Nothing. And it was by imagination that we moved outward again, to reconnect with the Other in their unique individuality, to see in those others, distinct and different and utterly themselves as they were, the glimmerings of the wholeness of Divinity. And it finally dawned on me that this was where I was going to need to look for the gods and goddesses of polytheism: singing and breathing and moving deep in the flux and beauty of the world. It was through my imagination, embarrassingly enough, that I would have to invite them in. But then these realizations never last, do they? And I lost my notes (only now recovered as I clean out my desk and pack up my apartment, readying for the move), and I forgot what it was I had realized, and how, and what use I might have put it to. But the understanding was doing its silent, secret work in my subconscious anyway. And Brigid began, bit by bit, to trickle in. I use the metaphor, picked up from the Faery authors, of the imagination as a sensory organ - vision, hearing, touch, taste and smell tell us about the physical world and give us a basis for interpretation, while the imagination tells us about non-physical reality - it's still subject to interpretation and as a sense organ it's as prone to pareidola as the eyes are, but like our imperfect eyes it's what we have to perceive with. Just as an artist can develop a sense of color and a musician can learn perfect pitch, a visionary can learn the tones and sensation of the imagination and learn new and important things about reality through this fantastic sense of imagination. I called this a metaphor but maybe it's not, maybe it's literally true. Or maybe the concepts of metaphorical and literal truth don't actually apply here. My own path started solidly in yellow and mostly stayed there until the experience of Other beyond myself (e.g., like Brighid in full flame) become largely impossible to ignore. This is one of those karma runs over dogma things. Oddly, this has led to blue. I tend to use feri terminology, but there is more of a sense of a One along with the feri creation myth. I'm with nettle on the imagination side, but I would substitute intuition instead of imagination. Imagination is something that you do and intuition is something that comes of its own. The other parts of magic desire and will have plenty of doing, but intuition is its own grace.